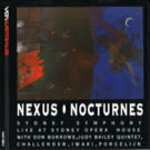 Nexus, Nocturnes / Sydney Symphony Orchestra. Stairs : for symphony orchestra / E. Kats-Chernin. 2003 education program : Australian composition resource kit / Sydney Symphony. Instrumentation: 3 flutes, 3 oboes, 2 clarinets, bassoon, contrabassoon, 4 horns, 3 trumpets, 3 trombones, percussion (2 players), piano, strings. Book: 2003 Australian composition resource kit. Book: Meet the music . Teaching kit 3. 23 Jan 2010: at Symphony in the Domain (The Domain). Featuring Sydney Symphony, Paul Kildea. 1987: Concert hall, Sydney Opera House. Featuring David Hare, Hiroyuki Iwaki, Sydney Symphony. 1985: Adelaide Town Hall. Featuring Christopher Seamen, Australian Youth Orchestra.